The forthcoming Han Solo film has lost both of its directors mid-production. 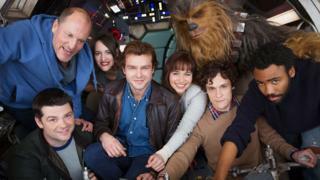 Phil Lord and Christopher Miller said their departure was down to "creative differences" with producers. The announcement on the official Star Wars website came after months of conflict between the pair and Kathleen Kennedy - the president of Lucasfilm and a producer on the movie. Kennedy said the duo were "talented filmmakers" but had "different creative visions" to the Lucasfilm team. She added a new director for the currently untitled film will be announced soon. The movie is scheduled for release on 25 May 2018. Lord and Miller have previously directed The Lego Movie, Cloudy With A Chance of Meatballs and 21 Jump Street. Kathleen Kennedy, president of Lucasfilm, said: "Phil Lord and Christopher Miller are talented filmmakers who have assembled an incredible cast and crew." "But it's become clear that we had different creative visions on this film, and we've decided to part ways. A new director will be announced soon." Lord and Miller said: "Unfortunately, our vision and process weren't aligned with our partners on this project. We normally aren't fans of the phrase 'creative differences' but for once this cliche is true. "We are really proud of the amazing and world-class work of our cast and crew."